The Cube is coming to the Wild, Wild, West! That’s right, Deadmau5 is bringing his iconic Cube setup to Goldrush! The Cube was originally debuted in 2010, but has since received an upgrade. The giant state-of-the-art LED structure syncs lights and graphics to his masterful beats that creates an unmatched energy. 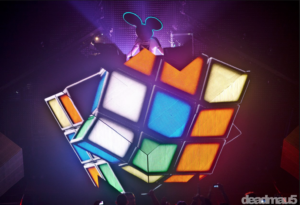 Along with his Cube, be ready to hear the classics as well as new music from his recently released EP “mau5ville: Level 1” which features Rob Swire, Getter, GTA and more. Goldrush September 28th & 28th in Chandler Arizona at the Legendary Rawhide Western Complex. It is rapidly approaching and we could not be more excited to see you there.